It's amazing that 10 years have passed since Sean and I put together GURPS Fourth Edition. It was a privilege to co-author it, and the special glee of seeing my own campaign's house rules become part of GURPS hasn't worn off! After Fourth Edition appeared, I worked with the talented Kenneth Peters and David Morgan-Mar on big expansions of GURPS Ultra-Tech and GURPS Bio-Tech, first released as hardbacks (now available as PDFs). But where Fourth Edition really came alive was in its original digital releases, both standalone volumes and Pyramid magazine (where I contribute a monthly column, "Eidetic Memory"). 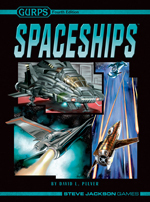 I especially enjoy writing new rules, and the eight-volume GURPS Spaceships series is a personal favorite. Its heart is a simple-but-comprehensive spaceship-design system, but each volume adds both worked examples and modular rules for topics like interstellar trade, exploration, or cinematic space combat. I'm grateful that so many gamers enjoyed it! The GURPS Mass Combat rules were also fun to write thanks to our amazing playtesters, who played out dozens of historical battles. In a departure from Third Edition's mass-combat rules, battles are fought round-by-round, allowing varying strategies each turn and roles for multiple PCs before and during the action. 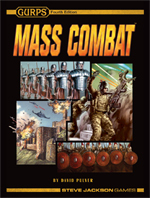 But for me, the real utility of Mass Combat is using it to tell epic stories in which adventurers mix personal adventuring and large-scale army combat, just like my favorite fantasy novels. "GURPS Psi-Tech" was a title I'd wanted to use for a long time, but it wasn't until Fourth Edition that I got my wish! This supplement amps up GURPS Psionic Powers with added psychotronics and bio-tech. Another Fourth Edition project with a lengthy backstory is GURPS Banestorm: Abydos, an urban fantasy of swashbuckling necromancers and the zombies they love. Look for more Abydos in Pyramid magazine . . .